Not only does a balanced breakfast give you energy for the rest of the day, but it helps you eat less and feel less hungry as the day goes on. It’ll prevent you from digging into the cookie jar when you get home from work, and will allow you to have a great workout at any point during the day. 1) High-Fiber Protein Pancake: Most people think of butter and syrup when they picture a pancake, but this is different. Instead, mix up the following ingredients and cook them the night before so you have this healthy pancake in the morning. Directions: Spray a nonstick pan with cooking spray and place on medium heat to preheat pan. Meanwhile, combine the egg whites and protein powder in a mixing bowl, stirring with a fork or whisk until well-blended. Add oatmeal, flax, baking powder and cinnamon and mix vigorously for about a minute. Check pan’s temperature by dropping a tiny amount of water on it. If the water bubbles/sizzles immediately, the pan is ready. Using a large spoon or small ladle, spoon a small amount of the batter into the pan, gently spreading it to a pancake shape if it’s too thick to do this on its own. Cook on one side until bubbles begin to appear and burst on the top of the batter. Using a spatula, carefully flip over and cook for roughly the same amount of time. Repeat until batter is gone. Serves 1. 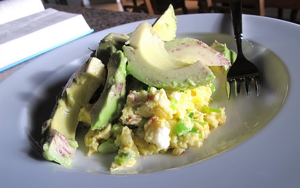 2) Scrambled Eggs with Avocado and Salsa: Scrambled eggs really aren’t that hard or time-consuming to make. People think you have to mix the eggs ahead of time, but you can just quickly stir them a few times while cooking and they’ll become scrambled – Amazing! I like mixing two Omega-3 Eggs with ½ cup Egg Whites and adding Spinach. Then, top with slices of avocado and fresh salsa. It’s a quick breakfast fit for a king (or queen). 3) Whey Protein Smoothie: When you’re in a rush you can make this smoothie the night before, or quickly in the morning. The key thing is to use a single-serve blender unit, like a Magic Bullet, so you don’t have to worry about cleaning a huge, messy blender when you’re done. We like to combine the following: 1 Cup Unsweetened Vanilla Almond Milk, 1 scoop Prograde Vanilla Protein, 1 Tbsp Ground Flax, 1/3 Cup frozen unsweetened Mixed Berries, ½ Cup raw Spinach (the spinach adds a neat green color to the smoothie, but it still tastes awesome! Try it! ), and 1 Tbsp Natural Peanut or Almond Butter. 4) High-Protein Cereal: Face it, people love cereal because it’s easy to eat and can be healthy. But, most brands are covered with sugar and full of junk. Also, with just milk, it doesn’t really pack much metabolism-boosting protein. So, instead, try this with your normal breakfast bowl: Mix one scoop of Vanilla Prograde Protein with water or milk and pour that over a bowl of your favorite low-sugar breakfast cereal; some of our favorite are Uncle Sam, Bran Flakes (add your own raisins to make it Raisin Bran), Cheerios, Puffed Rice, and Shredded Wheat. 5) Nutty, Berry, Greek Yogurt: Most people think of yogurt as just a snack item, but it can be a great breakfast food too. However, like cereal, some yogurt is really like dessert, instead of a health food. So, skip all that sugar found in most yogurts and try this: Mix 6 ounces of 2% plain organic Greek yogurt with 2 Tbsp of slivered almonds, 1 tsp ground flax seeds and 1/3 cup frozen, thawed, unsweetened berries.